Normally I'm a fair weather walker and don't bother to go into the hills when the weather is unpromising. But occasionally an expedition under glowering skies can be rewarding. 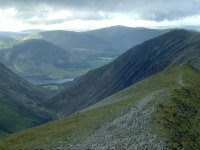 This was one such day, when I set out from Buttermere to walk the western horseshoe of the Grasmoor group, taking in Whiteless Pike, Hopegill Head and Whiteside. 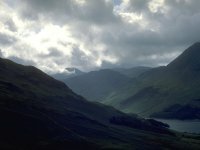 This is the initial view from Whiteless Breast, looking back at Buttermere. 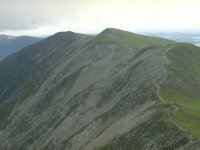 I made good time along the ridge of Whiteless Pike and on to the Grasmoor col, then across Codale Hause. Here, on Sand Hill, I'm looking southwards across Codale Hause to the great bulk of Eel Crag (2749 ft). 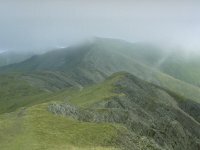 From the top of Hopegill Head (2525 ft), half a mile north of Codale Hause, this is the view westwards along the ravine of Gasgale Gill. The approch to Whiteside along the ridge from Hopegill Head. 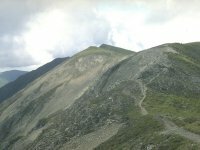 The dramatic scree slopes falling southwards to Gasgale Gill are well seen from here. Whiteside in all its glory. 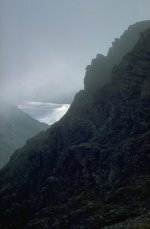 This shot does make the walk along the ridge look very arduous, but it's actually a straightforward and delightful walk. 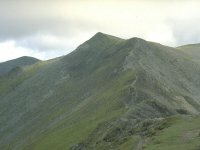 A glance backwards from the col to Hopegill Head. Codale Hause is behind and to the right. 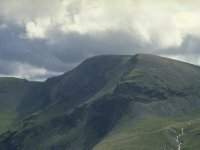 Looking back to along the ridge from the top of Whiteside (2317 ft) to Hopegill Head, with Grizedale Pike beyond. Wow! A glimpse of Crummock Water from high on the ridge of Whiteside. The walk down the western ridge of Whiteside is simple enough though quite steep, and not a route I'd care to ascend. It comes out at the farm of Langthwaite Gate, in those days one of Lakeland's best tea shops, sadly no longer operating.